Pokémon is all the rage these days. They are everywhere and chances are, you know someone who is a fan. The Pokémon fever is on and there are so many fun ways to enjoy Pokémon. The Pokémon franchise has been around for more than a decade now and with another pair of Pokémon games out – Pokémon Sun and Moon – the Pokémon fever isn’t going anywhere anytime soon. As if the Pokémon Go craze wasn’t enough to make the world going crazy for the cuddly little creatures, the popular franchise takes you to yet another exciting adventure with the new role-playing games, commemorating the 20th anniversary of the Pokémon franchise. Just like their previous installments, each game follows the journey of a young Pokémon trainer and his quest to catch and train exciting new creatures. Trainers get to compete with other trainers and win battles to gain experience levels and increase their battle statistics. The beautiful journey takes you across the fictional islands of the Alola region – based on Hawaii – where you’ll come across fancy new Pokémon along with some exclusive ones in their Alola form – described as Alolan. The game was based on the previously adopted battle mechanic known as Mega Evolution, taken after their predecessors, Pokémon X and Y. The game is set across the beautiful Alola region which is made up of four magical islands, along with one artificial island. Beautifully surrounded by the sea, Alola constitutes a diverse ecology filled with fancy little creatures called Pokémon as natives of the Alola region. Each of the four islands has one guardian Pokémon that goes by one guardian deity. The guardian deity chooses the leaders of the islands known as the ‘kahunas’. These guardian Pokémon are collectively called the ‘tapu’. The residents of the islands worship them. Pokémon Sun and Moon are role-playing games with adventure elements, presented in a third-person perspective. The journey begins with a family moving to Alola, and a new focused Pokémon trainer sets out on a beautiful adventure spanning the four islands that make up the Alola region. The young trainer embarks on his own quest to adventure and discovery, catching newly discovered Pokémon along with some wild ones, found during random encounters. With the help of Professor Kukui and his mysterious assistant Lillie, the player encounters and catches several new Pokémon with “Poké Balls”, adding them to their exclusive collection. Access to two new mysterious Pokémon. Pokédex has been upgraded to the new Rotom Pokédex. The Mythical Pokémon Magearna is available for both the games. A new element, Z-Moves has been introduced into the Pokémon battles. More communication features for the Battle Format via Link Battles. Ability to Mega Evolve – Mega Evolution. Clean up your Pokémon with the new Pokémon Refresh features. More playful gameplay with Alola Fashions. The first notable difference between the two Pokémon games is the one related to time of day. With exception to a few scenes, they are tied to the actual time. Pokémon Sun follows the same timeline as the Nintendo 3DS system, with the time in Pokémon Moon being shifted to 12 hours ahead of the time in the real world. You’ll see a lot of stars and moon when playing Pokémon Moon, whereas the Pokémon Sun players will see more daylight. Legendaries are some of the most powerful creatures you’ll come across, with some being exclusive to each game. Solgaleo, for one, is the guardian deity of Pokémon Sun and has remarkable resemblance to the sun. Lunala, on the other hand, is the guardian deity of Pokémon Moon and which glitters like a crescent moon. Although there isn’t much of a difference when it comes to the plot, but some of the island challenge trials have some differences. Island trials have replaced the typical eight gyms. The boss-like totem Pokémon can differ between Sun and Moon. The totem Pokémon on Melemele Island is Gumshoos, while in Moon it’s an Alolan Raticate. The Sun-exclusive Pokémon are Tortunator, Lycanroc (Midday Form), Alolan Vulpix & NInetails, Solgaleo, Passimian, and UB-02 Expansion. The Moon-exclusive Pokémon include Lycanroc (Midnight Form), Drampa, Oranguru, Lunala, Alolan Sandshrew & Sandslash, and UB-02 Beauty. It follows the real-time schedule and the game will be bright and sunny in the Alola region. Moon is 12 hours ahead of the time in the real world and the players will play in the evening. Solgaleo is the guardian deity of Pokémon Sun. Its signature move is Sunsteel Strike, which disregards the target’s ability. Lunala is the guardian deity of Pokémon Moon. Its signature move is Shadow Shield, which shields the Pokémon from taking maximum damage that lands when the Pokémon has full HP. The Sun-exclusive Turtonator is the only non-legendary Fire Dragon in the game. Its signature move is Shell Trap – a powerful Fire attack that bounces back damage to the opponent. The Moon-exclusive Drampa, on the other hand, is the first ever Dragon in the game, which are immune to Ghost attacks. The totem Pokémon on the Melemele Island is Gumshoos. The totem Pokémon is an Alolan Raticate in Moon. Exclusive Pokémon include Lycanroc (Midday), Alolan Vulpix & Ninetails, Passimian, Tortunator, Solgaloe, and UB-02 Expansion. Moon-Exclusive Pokémon include Lycanroc (Midnight), Drampa, Lunala, Alolan Sandshrew & Sandslash, Oranguru, and UB-02 Beauty. Like the previous installments, the differences between Pokémon Sun and Pokémon Moon are subtle with some smaller aesthetic differences worth mentioning such as time difference, exclusive Pokémon, etc. Pokémon always comes in two flavors, each with its own story and exclusive creatures, but it’s enough to tip players over from one version to another. If you prefer flashy schemes and feline Pokémon, go for Pokémon Sun. If gigantic bats fascinate you the most and you like the blue and purple theme throughout, grab Pokémon Moon. Pokémon Sun operates on the same time as your Nintendo 3DS system – that is your system time. Pokémon Moon, on the other hand, runs 12 hours ahead of the current time. The biggest difference is probably the cover stars. You’ll get the psychic Solgaleo with the package if you opt for the Sun, which boasts a special ability called Full Metal Body. Moon, on the other hand, includes the ghost-type Pokémon Lunala, whose signature move is Shadow Shield. 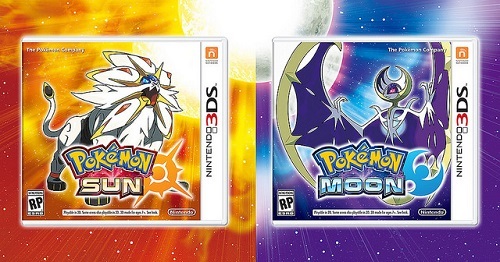 The differences worth mentioning are of course the version exclusive Pokémon available for each game. Pokémon Sun has a stronger and more varied line-up than the Moon, but if you consider quality over quantity, Moon-exclusive Pokémon won’t disappoint either. Sagar Khillar. "Difference Between Pokémon Sun and Pokémon Moon." DifferenceBetween.net. October 24, 2017 < http://www.differencebetween.net/object/gadgets-object/difference-between-pokemon-sun-and-pokemon-moon/ >.